Unique black sand beaches and a warm sea, sourround our amazing Puro Surf complex, where we will be staying in our Surf and Yoga Retreat. It is an ideal place to disconnect from absolutely everything and blend in with nature, the sea and above all with ourself. There is not much more to say, the following video will show you all about this small paradise in El Salvador. El Zonte beach is perfect for all kinds of surfers. There are spots where beginners can make their first steps into surfing; and, some others with lefts and rights where the more advanced surfers can play in the waves like kids and advance with their surfing level forward. 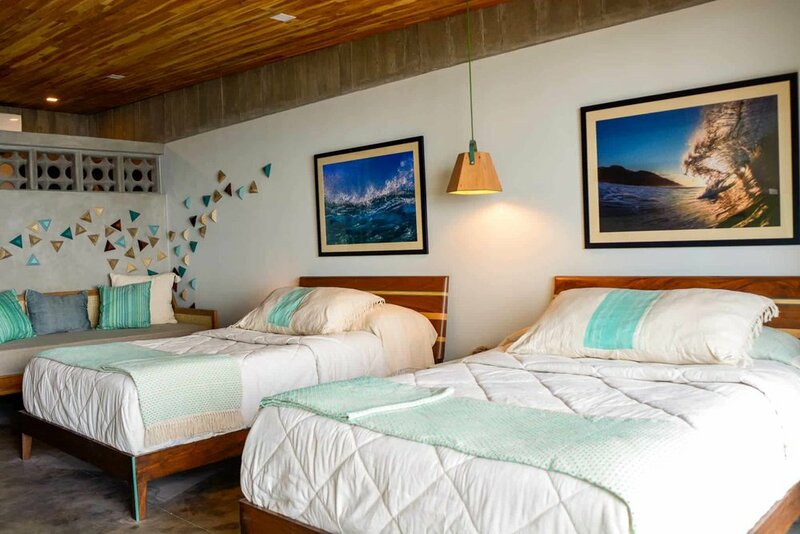 Better even because Puro Surf is located just in front of the renowned surfing spot, so you will be able to observe the waves as soon as you wake up or while having breakfast. We´ve got options for all! Luxury rooms with sea view, apartments for 3 or 4 people if you are coming with friends, and also dorms to share. All options are very confortable and upscale. Inside the complex you can also find a Yoga Shala with a view of the sea, a gym, a surf academy with a Carver Skate Bowl, a pool with an amazing view of the ocean, and, plenty of green areas in the surroundings to rest, read or just chill. Covana is an open bamboo roof restaurant with a stunning view of the ocean. 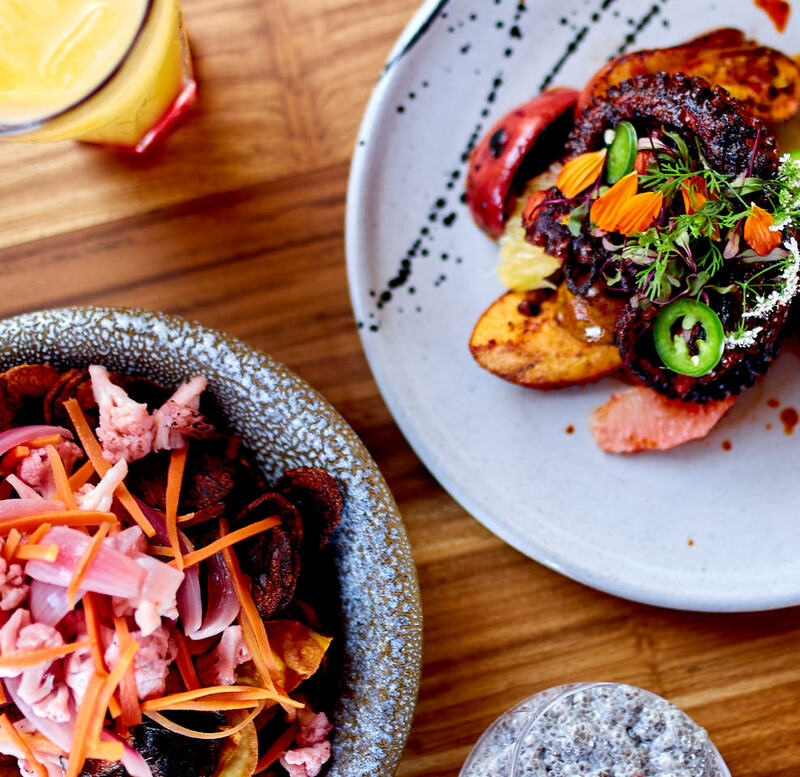 It is inside the Puro Surf Hotel complex and it combines to perfection local and fresh ingredients with a gourmet touch to delight all palates. We will offer a healthy, nutritious and delicious menu, specially made for us bearing in mind our days full of surfing and yoga. We have included in our package a smoothie or fruit juice per day to add all the nutrients our body needs. It is an excellent place for both advanced as well as newcomers to surfing because of its wave type diversity across the shore. You will be able to find easy waves to learn from scratch and also long and perfect waves to manoeuvre and improve your skills. The classes are taught by Marcelo Castellanos and all the Puro Surf Academy team that is the best surfing school of the country. All the teachers are certified by ISA (International Surfing Association) and the installations have a surfing gym, a pool to improve paddling and a Carver Skate Bowl to improve skills outside the water. Everyday we will go searching for the best waves depending on the conditions of the sea, wind and tides. Everyday we will practise Yoga, Pranayama and meditation sessions with sea view in the Shala of Puro Surf complex. We will visit different beaches and the surroundings. We will also go out trekking in the jungle to the Tamanique Waterfalls, where we will dive and enjoy the fresh water in the middle of the jungle. Our wave in front of Puro Surf. Certified Yoga teacher by QCI 500hs. Founder of Swarupa and world traveller. *Prices are per guest in American Dollars. **Save your spot before February 15th and get a 10% discount on your Swarupa retreat.